A supervised nursery is available every Sunday morning during the 9:15 a.m. Sunday school service and the 10:30 a.m. worship service for infants and toddlers through the age of 34 months. We are committed to your child’s safety and comfort. As you entrust us with the care of your little ones, we intend to do all that we can to respect and honor that trust. Meets during the worship service two Sundays a month. Children age 3 - 2nd Grade are invited to participate in children’s worship. It is a time to sing and make music, pray, have a story and make a craft. The children will be dismissed prior to the sermon, and will come back to the sanctuary during the song following the sermon. On the other Sunday mornings, Worship time includes a Children’s focus time. Children 2 years old through 6th grade are encouraged to attend our Sunday School Classes. Grade levels meet in individual classrooms. Children are invited to study about God with music, experience a Bible Story lesson and share in discussion on real life applications of their learning. This choir, for grades K-6 practices on Sunday mornings and sings occasionally during Sunday morning worship. Each summer Bible School is offered for children 4 years old through grade 5. Students grades 7-8 meet Sunday morning for Bible Study. Their sponsors encourage spiritual growth and provide additional fellowship, input and service opportunities. The MYF is a high school aged group promoting Christian growth and fellowship. Students grades 9 through 12 meet on Sunday morning with Sunday School teachers to introduce students to Christ, experience new life relationships and expand their knowledge of God. During the school year, youth and sponsors meet on Wednesday nights. Community youth are welcome at all times. Provides fellowship and spiritual growth for women. The women meet all day on the first Wednesday of each month for fellowship, inspiration, and the knotting of comforters and quilting. Adult Sunday School groups meet at 9:15 a.m. and are divided into different groups of various ages and interests. There are nine adult classes. Each one serves as a caring support group as well as a group that studies and learns together. Everyone is welcome to join any group. Requests for prayer can be phoned in to our church office secretary (330) 669-2697 who brings the request to our prayer chain. The prayer chain activates the whole congregation to pray specifically about each request they receive. SUNDAY MORNING WORSHIP – 10:30 a.m. The truths of the Christian faith are presented in a practical way through Biblical preaching, traditional and contemporary music, drama, offering and prayer. The CD/DVD Ministry Team delivers tapes of the Sunday services along with worship bulletins to shut-ins. 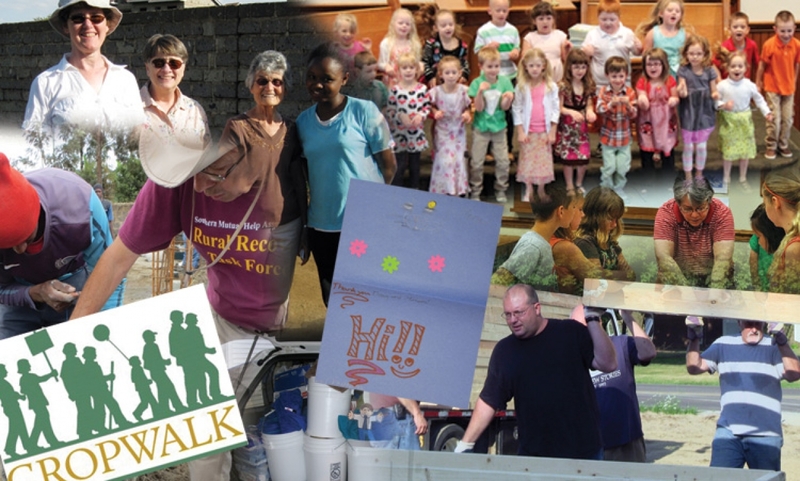 Members and individuals in the community who have financial needs that cannot be met by any other community agency are assisted by donations of the congregation. If you or one of your family members need special assistance in times of grief or stress, call the church office. Our Spiritual Life Commission oversees a Stephen Ministry trained Visitation Team to assist you. Our Pastoral staff is available for crisis ministries.